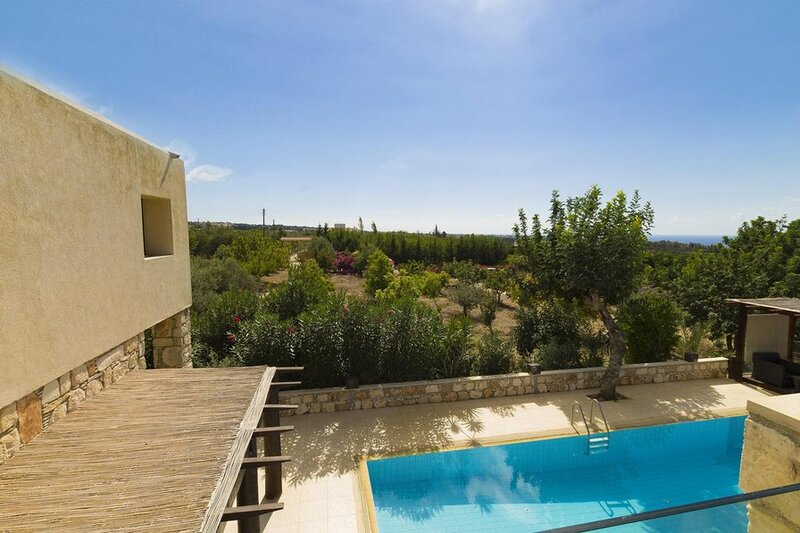 Villa Odysseas is a very substantial and unique stone built holiday home situated in the lower reaches of Tala and within easy reach of all amenities. The villa is very traditional, yet with many contemporary features and benefits from 4 bedrooms all with en-suite, a cloakroom, a dining area with adjacent kitchen (which is fully equipped with all modern appliances including dishwasher) and a large open plan lounge area with choice of seating, open fire, wi-fi and Satellite TV. The exterior of the villa (situated within a 4500 sqm plot) is exceptional with long private driveway leading past the fruit orchards to a large parking area with covered car port. The private swimming pool is 11m x 4m and is extremely private due to the grounds around it and distance between the few neighbouring houses. The private pool area is surrounded by large patios with sun loungers, a very nice decking area with outside sofa set and the main terrace for dining which is covered with a pergola fitted with woven fabric for shade. There is an upstairs balcony also which affords wonderful views to the Sea with Paphos in one direction and Coral Bay in the other. Villa Odysseas is a very substantial, luxury villa, fully air conditioned and equipped for you to have a relaxing holiday. It’s spacious, bright and airy with furniture able to accommodate 8 people in comfort. The ground floor is a large open plan area comprising lounge with internal stone detail, dining area and fully equipped kitchen. A covered outside terrace opens off the lounge to the garden and private swimming pool. The kitchen is large and very well equipped including fridge/freezer, microwave, a washing machine and dishwasher. Between the kitchen and dining area there’s a breakfast bar with leather stools and overhead lighting on a contemporary looking wooden beam. The dining area has a glass topped table and 8 leather chairs with doors opening out to the side garden area. The airy lounge area has a corner sofa, perfect for relaxing in front of the television with Satellite and DVD player. From the lounge, doors open out onto a covered terrace with seating for 8 – perfect for relaxing in the shade, alfresco dining and socialising with your party. Completing the Ground Floor is a bedroom with 2 x single beds and an en-suite shower room. Perfect for those who do not wish to climb stairs at any time. A smart open plan wooden staircase leads upstairs to a gallery area with desk and reading area as well as 3 good sized bedrooms all with en-suite showers. The master bedroom has a super-king sized bed and en-suite bathroom including bath with shower over, his and hers wash hand basins and heated towel rail. The second upstairs room which enjoys stunning mountain views, has twin beds and an en-suite shower room in contemporary design. The third bedroom upstairs has a double bed, an en-suite shower and access to the upstairs balcony which hosts seating and a table for 4 and affords wonderful views across the surrounding agricultural land and to the Sea. After watching a spectacular sunset, you can sit here for hours star gazing at the crystal clear Cyprus skies. The villa also benefits from oil fired central heating making the villa suitable for a holiday at all times of year. Wireless Internet is included in the rental rate. Villa Odysseas is an attractive stone built villa with large grounds surrounding. The 4500m2 plot includes a fruit orchard which supplies a vast range of usual and unusual fruits depending on the season. There is a small swing in the adjacent garden areas. The enclosed and landscaped gardens include an 11m x 4m swimming pool with outside shower. The pool is surrounded by areas for loungers and a barbecue. The villa has six loungers and two large umbrellas to make the most of the pool area. A raised decking area looks back into the house and across the gardens and hosts a sofa set which is ideal for enjoying a coffee, breakfast or a pre-dinner aperitif. Nissan Terrano 7 seater 4 x 4 included in the rental price. The villa has a very central location and is accessed from a lovely country lane on the edge of the village of Tala near Kissonerga. It’s just a 10-15 minute stroll into Kissonerga village where you’ll find a good selection of shops (George’s supermarket is less than 1km away and has everything you need), a bank and a few restaurants, one of which is an English style country pub (The Village Inn) if you are missing home. There is also a contemporary sports bar for those football fans out there. Within easy reach by car (1km up gradual hill) is Tala Square which is popular for lunches, relaxing with a drink and evening meals on the verandas of the high quality restaurants, many with stunning views over Paphos and to the Sea. (The Gallery (upmarket), The Square (Popular with English-set menus etc), Masa Soura (Greek) and ‘Stamna’ (traditional Cypriot tavern) are all very popular with other cafes and eateries well worth a try also. Tala is a popular and growing village, just 5km north of Paphos, set on a south facing hillside looking out over the blue Mediterranean. Immediately north of the village is the famous Agios Neophytos monastery dating from 1159. This is well worth a visit even if just for a coffee or to buy some traditional honey. In the fields around Tala you’ll find vineyards, orange, lemon, olive and almond trees and banana plantations. You can drive to Villa Odysseas from Paphos Airport in about thirty minutes. From the villa it’s an easy drive into Paphos for some of the best shopping you’ll find anywhere in Cyprus. It’s also an easy drive to the centre of Peyia – a vibrant community stretching from the bright lights of Coral Bay to the traditional centre of the old village. There is a good choice of beaches within an easy drive. Try Coral Bay (4km) – a great beach with every amenity you could imagine. Alternatively drive up the coast road into the Akamas Region (10km) to enjoy the quiet and unspoilt beaches of Lara and beyond. Please note that this property can be accessed anytime after 3pm on arrival so dont worry about late flights. We can arrange taxi transfer by our own driver who knows where the property is. The property is professionally managed (you will always have a contact) and has linen changes and cleaning on a weekly basis (10-28 night stays). Air-Conditioning is included in the rental price (bedrooms only/lounge payable extra if required) as is a welcome pack of basic essentials for your arrival. Please note that we need a fully refundable £350 security deposit to cover the excess on the car in case of any damage. The car will be waiting at the villa for you on arrival. We can arrange a taxi transfer from our own driver who knows where the property is. Price for 2-4 guests is just 30 euros. 5-6 guests is 35 euros. 7 guests can be taken for 40 euros and 8 for 60. The car is insured for any driver aged 25-70 on a fully comprehensive basis. Sea and Mountain Views Gas & Traditional Style BBQs Satellite TV 8 Sun Loungers and 2 Parasols by pool. Super-King Sized in Master Bedroom Outside Shower and changing room Safety Deposit Box. Travel Cot & Highchair available on request Selection of childrens games, Backgammon & Chess. Free 7 seater, 4x4 car included in rental price. Wireless internet/Wi-Fi included.